Zucchini, also known as courgette or summer squash, is a member of the squash family. It is officially an immature fruit though it is mainly thought of as a vegetable. It can be light or dark green and can grow up to a meter in length, though they are harvested at around ten inches. There is also a hybrid called Golden Zucchini that is a deep yellow or even orange in color. Zucchini flowers can also be cooked and eaten. – Always wash your zucchini well before prepping. It is good to use a veggie brush if you have one, just go gentle on the delicate skin. – Though it is most often enjoyed cooked, zucchini can also be eaten raw – sliced lengthwise as an addition to a crudite platter, or even shredded in a salad. – Zucchini can be cooked in almost any way – tempura, fried, stir fried, grilled, roasted, in stews, in casseroles. – It can even be grated and baked in bread or cupcakes, soups, savory pancakes. – Raw and vegan food enthusiasts use a mandolin to slice zucchini lengthwise into long pasta-like strips and toss in savory raw sauce. Look for zucchini that’s small to medium sized (no longer than 8 inches, longer could mean a more mature fruit), firm and free of nicks. Zucchini tends to not store for very long, better to use quickly. 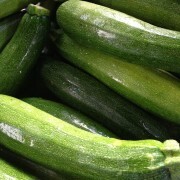 To extend life wrap unwashed zucchini tightly in plastic, store in refrigerator. Will keep up to a week, but careful not to let it get bruised up.